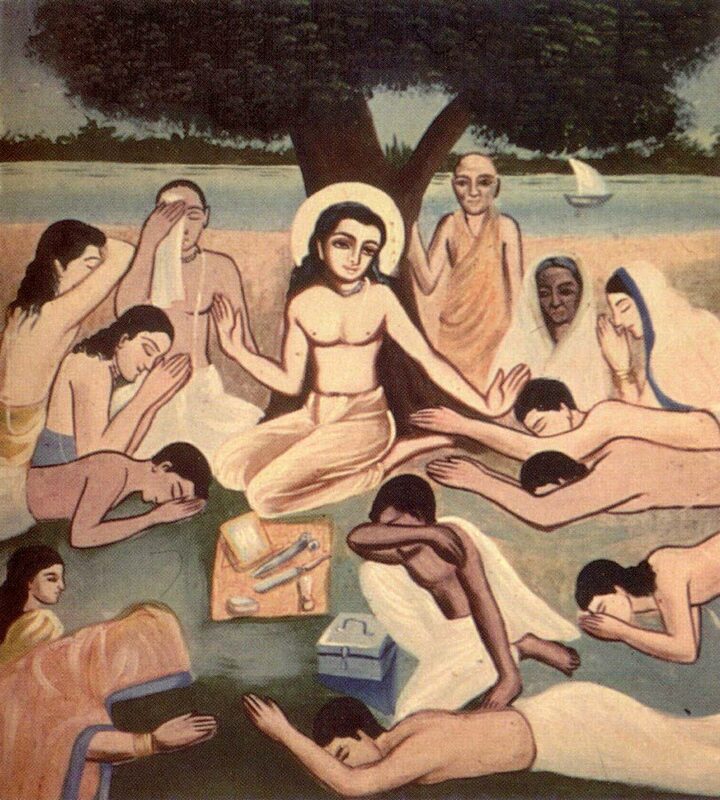 Chaitanya Mahāprabhu was born in Māyāpur, in the town of Nadia, just after sunset on the evening of the 23rd Phālguna, 1407 Śakābda, answering to the 18th of February, 1486, of the Christian Era. The moon was eclipsed at the time of His birth, and the people of Nadia were then engaged, as was usual on such occasions, in bathing in the Bhāgīrathī with loud cheers of “Haribol!” His father, Jagannātha Miśra, a poor brāhmana of the Vedic order, and His mother, Śacī-devī, a model good woman, both descended from brāhmana stock originally residing in Sylhet. 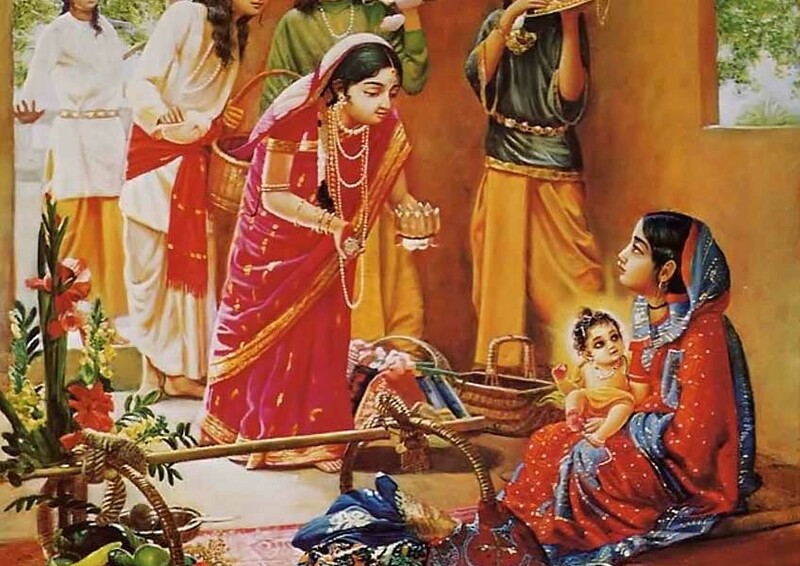 Mahāprabhu was a beautiful child, and the ladies of the town came to see Him with presents. His mother’s father, Pandita Nīlāmbara Cakravartī, a renowned astrologer, foretold that the child would be a great personage in time, and he therefore gave Him the name Viśvambhara. The ladies of the neighborhood styled Him Gaurahari on account of His golden complexion, and His mother called Him Nimāi on account of the nima tree near which He was born. Beautiful as the lad was, everyone heartily loved to see Him every day. As He grew up He became a whimsical and frolicsome lad. After His fifth year, He was admitted into a pāthaśālā [school], where He picked up Bengali in a very short time. Most of His contemporary biographers have mentioned certain anecdotes regarding Chaitanya, which are simple records of His early miracles. It is said that when He was an infant in His mother’s arms He wept continually, and when the neighboring ladies cried “Haribol!” He used to stop. Thus there was a continuation of the utterance of “Haribol!” in the house, foreshowing the future mission of the hero. It has also been stated that when His mother once gave Him sweetmeats to eat He ate clay instead of the food. His mother asking for the reason, He stated that as every sweetmeat was nothing but clay transformed He could eat clay as well. His mother, who was the consort of a pandita, explained that every article in a special state was adapted to a special use. Earth while in the state of a jug could be used as a waterpot, but in the state of a brick such a use was not possible. Clay, therefore, in the form of sweetmeats was usable as food, but not clay in its other states. The lad was convinced and admitted His stupidity in eating clay and agreed to avoid the mistake in the future. Another miraculous act has been related. It is said that a brāhmana on pilgrimage became a guest in His house, cooked his food and read his grace with meditation on Krishna. In the meantime the lad came and ate up the cooked rice. The brāhmana, astonished at the lad’s act, cooked again at the request of Jagannātha Miśra. The lad again ate up the cooked rice while the brāhmana was offering the rice to Krishna with meditation. The brāhmana was persuaded to cook for the third time. This time all the inmates of the house had fallen asleep, and the lad showed himself as Krishna to the traveler and blessed him. The brāhmana was then lost in ecstasy at the appearance of the object of his worship. It has also been stated that two thieves stole away the lad from His father’s door with a view to purloin His jewels and gave Him sweetmeats on the way. The lad exercised His illusory energy and deceived the thieves back toward His own house. The thieves, for fear of detection, left the boy there and fled. Another miraculous act has been described of the lad’s demanding and getting from Hiranya and Jagadīśa all the offerings they had collected for worshiping Krishna on the day of Ekādaśī. When only four years of age, He sat on rejected cooking pots, which were considered unholy by His mother. He explained to His mother that there was no question of holiness and unholiness as regards earthen pots thrown away after the cooking was over. These anecdotes relate to His tender age up to the fifth year. In His eighth year, He was admitted into the tola (school) of Gangādāsa Pandita, in Gangānagara, close by the village of Māyāpur. In two years He became well read in Sanskrit grammar and rhetoric. His readings after that were of the nature of self-study in His own house, where He had found all important books belonging to His father, who was a pandita himself. It appears that He read the smrti in His own study, and the nyāya also, in competition with His friends, who were then studying under the celebrated Pandita Raghunātha Śiromani. Now, after His tenth year, Chaitanya became a passable scholar in grammar, rhetoric, the smrti and nyāya. It was after this that His elder brother Viśvarūpa left His house and accepted the āśrama (status) of a sannyāsī (ascetic). Chaitanya, though a very young boy, consoled His parents, saying that He would serve them with a view to please God. Just after that, His father left this world. His mother was exceedingly sorry, and Mahāprabhu, with His usual contented appearance, consoled His widowed mother. It was at the age of fourteen or fifteen that Mahāprabhu was married to Lakshmīdevī, the daughter of Vallabhācārya, also of Nadia. He was at this age considered one of the best scholars of Nadia, the renowned seat of nyāya philosophy and Sanskrit learning. Not to speak of the smārta panditas, the naiyāyikas were all afraid of confronting Him in literary discussions. Being a married man, He went to eastern Bengal on the banks of the Padma for acquirement of wealth. There He displayed His learning and obtained a good sum of money. It was at this time that He preached Vaishnavism at intervals. After teaching him the principles of Vaishnavism, He ordered Tapana Miśra to go and live in Benares. During His residence in eastern Bengal, His wife Lakshmīdevī left this world from the effects of snakebite. On returning home, He found His mother in a mourning state. He consoled her with a lecture on the uncertainty of human affairs. It was at His mother’s request that He married Vishnupriyā, the daughter of Rāja Pandita Sanātana Miśra. His comrades joined Him on His return from pravāsa, or sojourn. He was now so renowned that He was considered to be the best pandita in Nadia. Keśava Miśra of Kashmir, who had called himself the Great Digvijayī (world conqueror), came to Nadia with a view to debate the panditas of that place. Afraid of the so-called conquering pandita, the tola professors of Nadia left their town on the pretense of invitation. 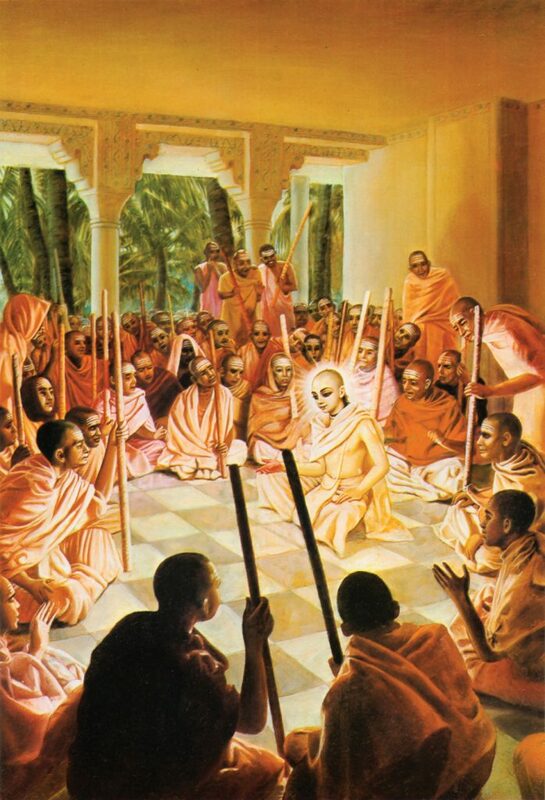 Keśava met Mahāprabhu at the Barokona-ghāṭā in Māyāpur, and after a very short discussion with Him he got defeated by the boy, and mortification obliged him to decamp. Nimāi Paṇḍita was now the most important pandita of the times. It was at the age of sixteen or seventeen that He traveled to Gayā with a host of His students and there took His spiritual initiation from Īśvara Purī, a Vaishnava sannyāsī and a disciple of the renowned Mādhavendra Purī. Upon His return to Nadia, Nimāi Pandita turned religious preacher, and His religious nature became so strongly represented that Advaita Prabhu, Śrīvāsa and others who had before the birth of Chaitanya already accepted the Vaishnava faith were astonished at the change in the young man. He was then no more a contending naiyāyika, a wrangling smārta and a criticizing rhetorician. He swooned at the name of Krishna and behaved as an inspired man under the influence of His religious sentiment. It has been described by Murāri Gupta, an eyewitness, that He showed His heavenly powers in the house of Śrīvāsa Paṇḍita in the presence of hundreds of His followers, who were mostly well-read scholars. It was at this time that He opened a nocturnal school of kīrtana in the compound of Śrīvāsa Paṇḍita with His sincere followers. There He preached, there He sang, there He danced, and there He expressed all sorts of religious feelings. Nityānanda Prabhu, who was then a preacher of Vaishnavism and who had completed His travels all over India, joined Him at that time. In fact, a host of pandita preachers of Vaishnavism, all sincere at heart, came and joined Him from different parts of Bengal. Nadia now became the regular seat of a host of Vaishnava ācāryas whose mission it was to spiritualize mankind with the highest influence of the Vaishnava creed. The first mandate that He issued to Prabhu Nityānanda and Haridāsa was this: “Go, friends, go through the streets of the town, meet every man at his door and ask him to sing the name of Hari with a holy life, and then come and report to Me every evening the result of your preaching.” Thus ordered, the two preachers went out and met Jagāi and Mādhāi, the two most abominable characters in Nadia. These two insulted the preachers on hearing Mahāprabhu’s mandate, but were soon converted by the influence of bhakti inculcated by their Lord. The people of Nadia were now surprised. They said, “Nimāi Pandita is not only a gigantic genius but is certainly a missionary from God Almighty.” From this time to His twenty-third year, Mahāprabhu preached His principles not only in Nadia but in all the important towns and villages around His city. In the houses of His followers He showed miracles, taught the esoteric principles of bhakti and sang His sankīrtana with other bhaktas. His followers in the town of Nadia commenced to sing the holy name of Hari in the streets and bazaars. This created a sensation and roused different feelings in different quarters. The bhaktas were highly pleased. The smārta brāhmanas became jealous of Nimāi Paṇḍita’s success and complained to Chand Kazi against the character of Chaitanya, claiming it was un-Hindu. The Kazi came to Śrīvāsa Paṇḍita’s house and broke a mrdanga (khola drum) there and declared that unless Nimāi Paṇḍita ceased to make noise about His queer religion he would be obliged to enforce Mohammedanism on Him and His followers. This was brought to Mahāprabhu’s notice. He ordered the townspeople to appear in the evening, each with a torch in his hand. This they did, and Nimāi marched out with His sankīrtana divided into fourteen groups. On His arrival in the Kazi’s house, He held a long conversation with the Kazi and in the end communicated into his heart His Vaishnava influence by touching his body. The Kazi then wept and admitted that he had felt a keen spiritual influence which had cleared up his doubts and produced in him a religious sentiment which gave him the highest ecstasy. The Kazi then joined the sankīrtana party. The world was astonished at the spiritual power of the Great Lord, and hundreds and hundreds of heretics converted and joined the banner of Viśvambhara after this affair. 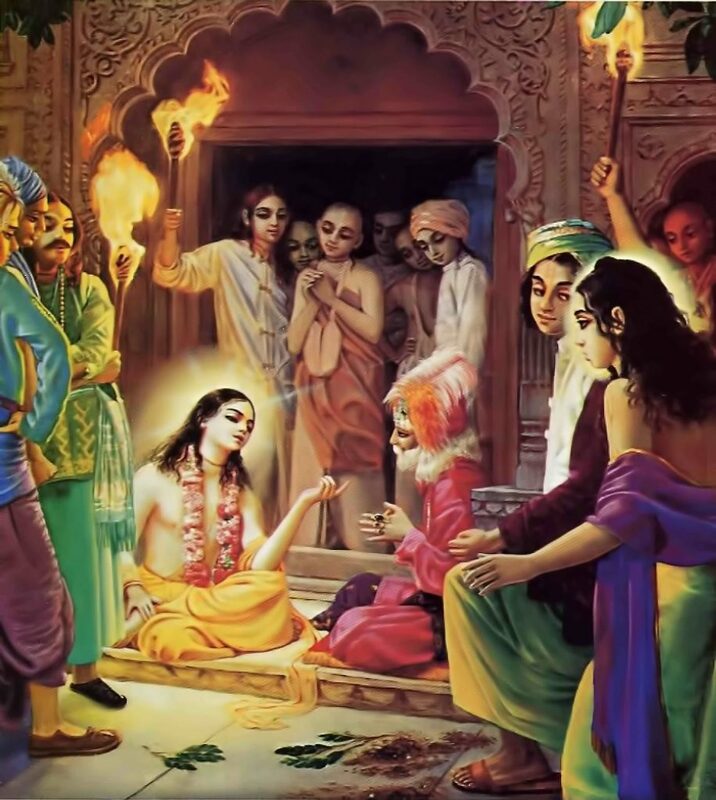 It was after this that some of the jealous and low-minded brāhmanas of Kulia picked a quarrel with Mahāprabhu and collected a party to oppose Him. Nimāi Paṇḍita was naturally a soft-hearted person, though strong in His principles. He declared that party feelings and sectarianism were the two great enemies of progress, and He saw that as long as He should continue to be an inhabitant of Nadia belonging to a certain family, His mission would not meet with complete success. He then resolved to be a citizen of the world by cutting off His connection with His particular family, caste and creed, and with this resolution He embraced the position of a sannyāsī at Katwa under the guidance of Keśava Bhāratī of that town, in the twenty-fourth year of His life. His mother and wife wept bitterly for His separation, but our hero, though soft in heart, was a strong person in His principles. He left His little world in His house for the unlimited spiritual world of Krishna with man in general. After His sannyāsa, He was induced to visit the house of Advaita Prabhu in Śāntipura. Advaita managed to invite all Mahāprabhu’s friends and admirers from Nadia and brought Śacī-devī to see her son. Both pleasure and pain invaded her heart when she saw her son in the attire of a sannyāsī. As a sannyāsī, Krishna Chaitanya put on nothing but a kaupīna and a bahirvāsa (outer covering). His head was without hair, and His hands bore a danda (stick) and a kamandalu (hermit’s waterpot). The holy son fell at the feet of His beloved mother and said, “Mother! This body is yours, and I must obey your orders. Permit Me to go to Vrindāvana for My spiritual attainments.” The mother, in consultation with Advaita and others, asked her son to reside in Purī (the town of Jagannātha) so that she might obtain news of Him now and then. Mahāprabhu agreed to that proposition and in a few days left Śāntipura for Orissa. His biographers have described the journey of Krishna Chaitanya (that was the name He got after His sannyāsa) from Śāntipura to Purī in great detail. He traveled along the side of the Bhāgīrathī as far as Chatrabhoga, situated now in Thānā Mathurāpura, Diamond Harbor, Twenty-four Parganas. There He took a boat and went as far as Prayāga-ghāṭa, in the Midnapura District. Thence He walked through Balasore and Cuttack to Purī, seeing the temple of Bhūvaneśvara on His way. Upon His arrival at Purī He saw Jagannātha in the temple and resided with Sārvabhauma at the request of the latter. Sārvabhauma was a gigantic pandita of the day. His readings knew no bounds. He was the best naiyāyika of the times and was known as the most erudite scholar in the Vedānta philosophy of the school of Śaṅkarācārya. He was born in Nadia (Vidyānagara) and taught innumerable pupils in the nyāya philosophy in his tola there. He had left for Purī some time before the birth of Nimāi Paṇḍita. His brother-in-law Gopīnātha Miśra introduced our new sannyāsī to Sārvabhauma, who was astonished at His personal beauty and feared that it would be difficult for the young man to maintain sannyāsa-dharma during the long run of His life. Gopīnātha, who had known Mahāprabhu from Nadia, had a great reverence for Him and declared that the sannyāsī was not a common human being. On this point Gopīnātha and Sārvabhauma had a hot discussion. Sārvabhauma then requested Mahāprabhu to hear his recitation of the Vedānta-sūtras, to which the latter tacitly submitted. Mahāprabhu thereupon explained all the sūtras in His own way, without touching the pantheistic commentary of Śankara. The keen understanding of Sārvabhauma saw the truth, beauty and harmony of the arguments in the explanations given by Chaitanya and obliged him to utter that it was the first time he had found one who could explain the Brahma-sūtras in such a simple manner. He also admitted that the commentaries of Śankara never gave such natural explanations of the Vedānta-sūtras as those he had obtained from Mahāprabhu. Sārvabhauma then submitted himself as an advocate and follower. In a few days he turned out to be one of the best Vaishnavas of the time. When reports of this came out, the whole of Orissa sang the praise of Krishna Chaitanya, and hundreds and hundreds came to Him and became His followers. In the meantime Mahāprabhu thought of visiting southern India, and He started with one Krishnadāsa Brāhmana for the journey. His biographers have given us details of the journey. He first went to Kūrmakṣetra, where He did a miracle by curing a leper named Vāsudeva. He met Rāmānanda Rāya, the governor of Vidyānagara, on the banks of the Godāvarī and had a philosophical conversation with him on the subject of prema-bhakti. He worked another miracle by touching (making them immediately disappear) the seven tāla trees from behind which Rāmacandra, the son of Daśaratha, had shot His arrow and killed the great Vāli Rāja. Mahāprabhu preached Vaishnavism and nāma-sankīrtana throughout His journey. At Rangaksetra He stayed for four months in the house of one Venkata Bhaṭṭa in order to spend the rainy season. There He converted the whole family of Venkata from Rāmānuja Vaishnavism to krishna-bhakti, including the son of Venkata, a boy of ten years named Gopāla, who afterwards came to Vrindāvana and became one of the Six Gosvāmīs, prophets serving under their leader Śrī Krishna Chaitanya. Trained up in Sanskrit by his uncle Prabodhānanda Sarasvatī, Gopāla wrote several books on Vaishnavism. Chaitanya visited numerous places in southern India as far as Cape Comorin and returned to Purī in two years by Pāndarapura on the Bhīmā. In this latter place He spiritualized one Tukārāma, who became from that time a religious preacher himself. This fact has been admitted in his ābhāngas, which have been collected in a volume by Mr. Satyendranāth Tagore of the Bombay Civil Service. During His journey He had discussions with the Buddhists, the Jains and the Māyāvādīs in several places and converted His opponents to Vaishnavism. 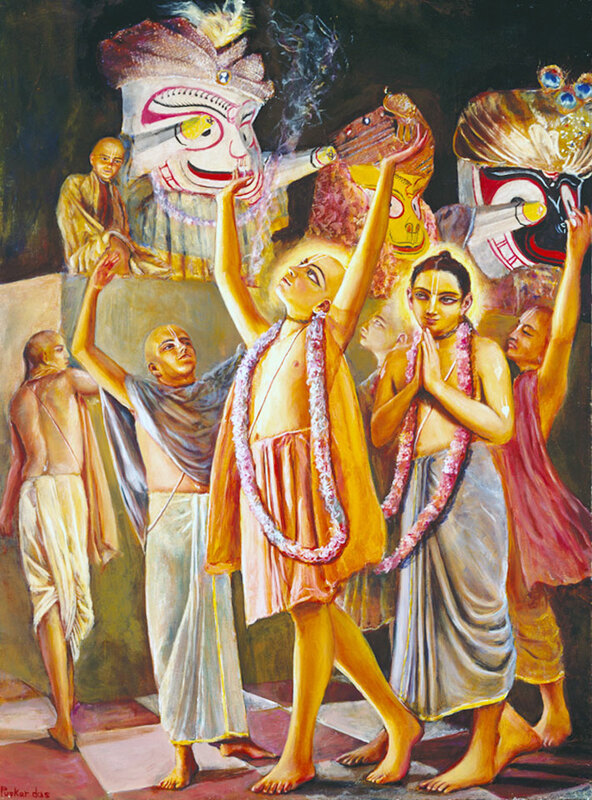 Upon His return to Purī, Rāja Pratāparudra-deva and several pandita brāhmanas joined the banner of Chaitanya Mahāprabhu. He was now twenty-seven years of age. In His twenty-eighth year He went to Bengal as far as Gauda in Malda. There He picked up two great personages named Rūpa and Sanātana. Though descended from the lines of the Karnātic brāhmanas, these two brothers had turned demi-Mohammedans by their continual contact with Hussain Shah, the then Emperor of Gauda. Their names had been changed by the Emperor into Dabira Khāsa and Sākara Mallika, and their master loved them heartily as they were both learned in Persian, Arabic and Sanskrit and were loyal servants of the state. The two gentlemen had found no way to come back as regular Hindus and had written to Mahāprabhu while He was at Purī, for spiritual help. Mahāprabhu had written in reply that He would come to them and extricate them out of their spiritual difficulties. Now that He had come to Gauda, both the brothers appeared before Him with their long-standing prayer. 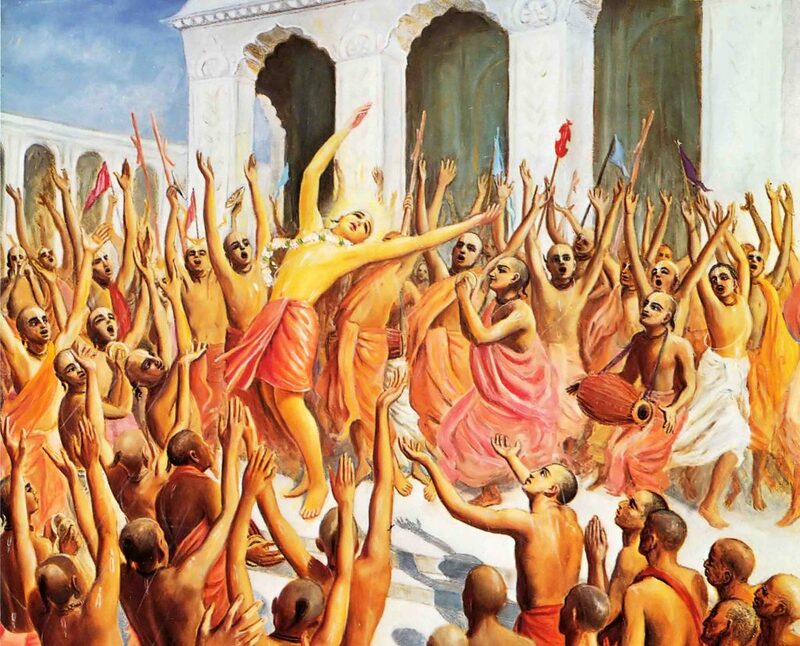 Mahāprabhu ordered them to go to Vrindāvana and meet Him there. Chaitanya returned to Purī through Śāntipura, where He again met His dear mother. After a short stay at Purī He left for Vrindāvana. This time He was accompanied by one Balabhadra Bhattācārya. He visited Vrindāvana and came down to Prayāga (Allahabad), converting a large number of Mohammedans to Vaishnavism by argument from the Koran. 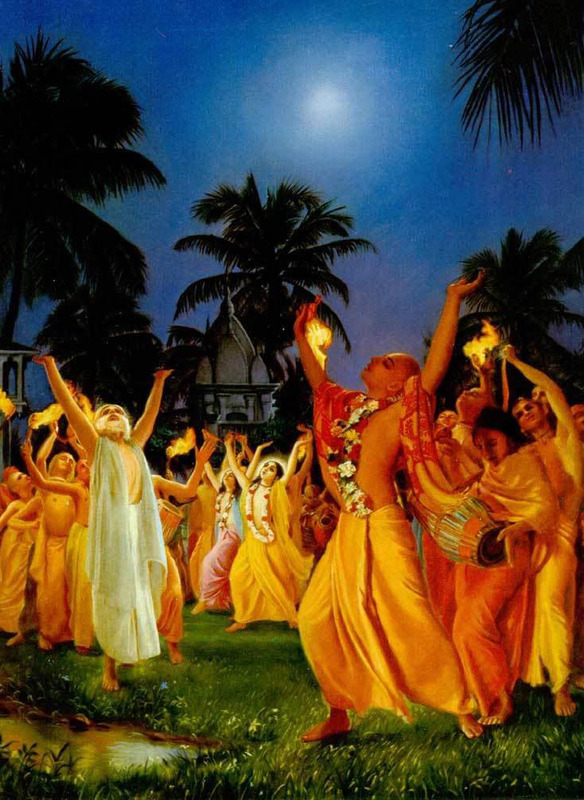 The descendants of those converts are still known as Pāthāna Vaishnavas. Rūpa Gosvāmī met Him at Allahabad. 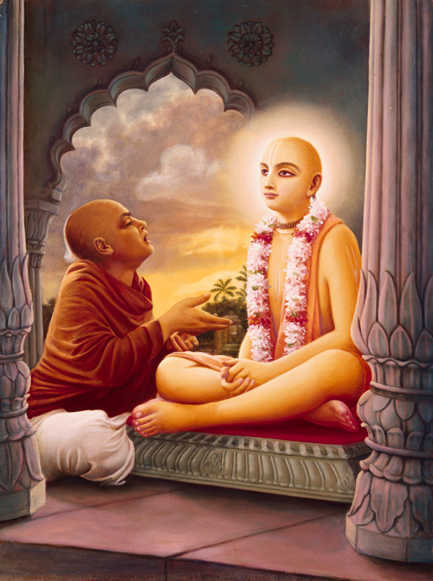 Chaitanya trained him up in spirituality in ten days and directed him to go to Vrindāvana on two missions. His first mission was to write theological works scientifically explaining pure bhakti and prema. The second mission was to revive the places where Krishnacandra had at the end of Dvāpara-yuga exhibited His spiritual līlā for the benefit of the religious world. Rūpa Gosvāmī left Allahabad for Vrindāvana, and Mahāprabhu came down to Benares. There He resided in the house of Candraśekhara and accepted His daily bhiksā (meal) in the house of Tapana Miśra. Here it was that Sanātana Gosvāmī joined Him and took instruction for two months in spiritual matters. The biographers, especially Krishnadāsa Kavirāja, have given us details of Chaitanya’s teachings to Rūpa and Sanātana. Krishnadāsa was not a contemporary writer, but he gathered his information from the Six Gosvāmīs themselves, the direct disciples of Mahāprabhu. Jīva Gosvāmī, who was a nephew of Sanātana and Rūpa and who has left us his invaluable work the Ṣat-sandarbhas, has philosophized on the precepts of his great leader. We have gathered and summarized the precepts of Chaitanya from the books of those great writers. While at Benares, Chaitanya had an interview with the learned sannyāsīs of that town in the house of a Maratha brāhmana who had invited all the sannyāsīs for an entertainment. 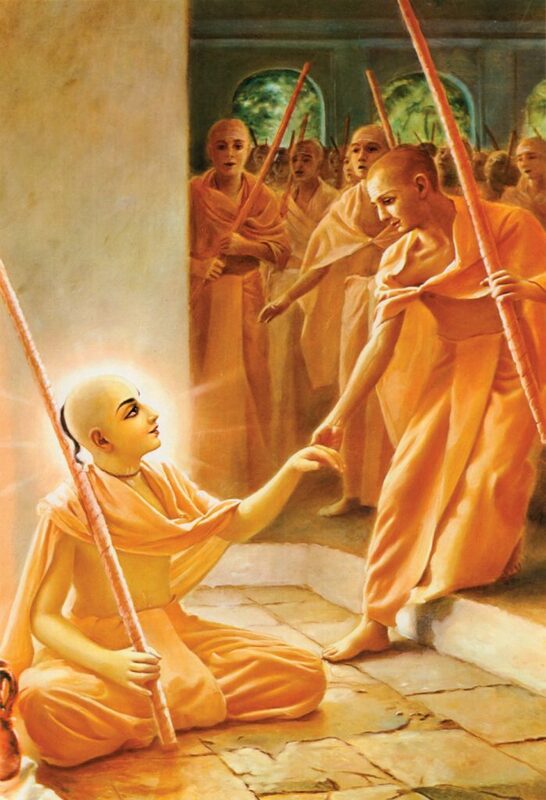 At this interview, Chaitanya showed a miracle which attracted all the sannyāsīs to Him. Then ensued reciprocal conversations. The sannyāsīs were headed by their most learned leader, Prakāśānanda Sarasvatī. After a short controversy they submitted to Mahāprabhu and admitted that they had been misled by the commentaries of Śankarācārya. It was impossible even for learned scholars to oppose Chaitanya for a long time, as there was some spell in Him which touched their hearts and made them weep for their spiritual improvement. The sannyāsīs of Benares soon fell at the feet of Chaitanya and asked for His grace (kṛpā). Chaitanya then preached pure bhakti and instilled into their hearts a spiritual love for Krishna, which obliged them to give up sectarian feelings. The whole population of Benares, on this wonderful conversion of the sannyāsīs, turned Vaishnava, and they made a massive sankīrtana with their new Lord. After sending Sanātana to Vrindāvana, Mahāprabhu went to Purī again through the jungles with His comrade Balabhadra. Balabhadra reported that Mahāprabhu showed a good many miracles on His way to Purī, such as making tigers and elephants dance on hearing the name of Krishna. From this time, that is, from His thirty-first year, Mahāprabhu continually lived in Purī, in the house of Kāśī Miśra, until His disappearance in His forty-eighth year at the time of sankīrtana in the temple of Ṭoṭā-gopīnātha. During these eighteen years, His life was one of settled love and piety. He was surrounded by numerous followers, all of whom were of the highest order of the Vaishnavas and who were distinguished from the common people by their purest character and learning, firm religious principles and spiritual love of Rādhā-Krishna. Svarūpa Dāmodara, who had been known by the name of Purusottamācārya while Mahāprabhu was in Nadia, joined Him from Benares and accepted service as His secretary. No production of any poet or philosopher could be laid before Mahāprabhu unless Svarūpa had passed it as pure and useful. Rāya Rāmānanda was His second mate. Both he and Svarūpa would sing while Mahāprabhu expressed His sentiment on a certain point of worship. Paramānanda Purī was His minister in matters of religion. There are hundreds of anecdotes described by His biographers which we do not think it meet here to reproduce. Mahāprabhu slept short. His sentiments carried Him far and wide in the firmament of spirituality every day and night, and all His admirers and followers watched Him throughout. He worshiped, communicated with His missionaries in Vrindāvana, and conversed with those religious men who newly came to visit Him. He sang and danced, took no care of Himself and oft times lost Himself in religious beatitude. All who came to Him believed in Him as the all-beautiful God appearing in the nether world for the benefit of mankind. He loved His mother all along and sent her mahā-prasāda now and then with those who went to Nadia. He was most amiable in nature. Humility was personified in Him. His sweet appearance gave cheer to all who came in contact with Him. He appointed Prabhu Nityānanda as the missionary in charge of Bengal. He dispatched six disciples (Gosvāmīs) to Vrindāvana to preach love in the upcountry. He punished all of His disciples who deviated from a holy life. This He markedly did in the case of Junior Haridāsa. He never lacked in giving proper instructions in life to those who solicited them. This was seen in His teachings to Raghunātha dāsa Gosvāmī. His treatment of Haridāsa (senior) showed how He loved spiritual men and how He defied caste distinction in the cause of spiritual brotherhood.